Our vision and values are at the core of everything we do. They provide the foundation upon which children can develop as individuals and aspire to be the best that they can be. "Igniting the Fire for Learning"
Spread Christian values in all we think, do and say whilst having regard for other faiths. Treat every person equally and make every person feel that they matter. Make sure everyone feels safe and happy. Make learning fun through challenge and team work. Help children understand how to improve their learning. Work independently or positively with partners or in groups. As a Christian school our core values permeate all aspects of school life. We have high expectations at St Mark's with regards to manners, behaviour, respectfulness and attendance. We actively encourage all members of the school community to share a smile each and every day and to undertake random acts of kindness. All our children at St Mark's feel valued, safe and secure. We discuss these values in worship in order that they can become fully embedded in all that we do at our school. Recognising its historic foundation, the school will preserve and develop its religious character in accordance with the principles of the Church of England and the Methodist Church and in partnership with the Churches at parish diocesan and circuit level. The school aims to serve its community by providing an education of the highest quality within the context of Christian belief and practice. It encourages an understanding of the meaning and significance of faith in Our Lord Jesus Christ and promotes Christian values through the experience it offers to all its pupils. 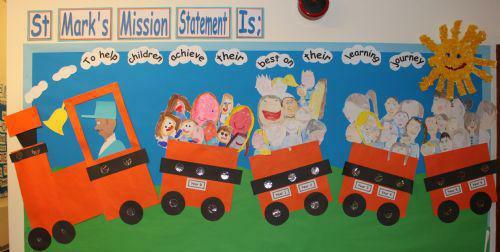 The vision, ethos, aims and Christian values are constantly promoted as they underpin the day-to-day life of the school. As part of the Bath & Wells MAT we are inextricably linked to Diocese of Bath & Wells and the belief ' That they may have life, life in all its fullness' John 10:10. If you wish for a printed copy of the school's aims and values please contact the school office.